As most of us have heard, the Blizzard thing has swept the nation in terms of disc golf buzz (no, not buzzz) this last couple of months. The Innova Champion Blizzard technology claims they put micro-bubbles into their Champion blend of plastic and it “allows them” to make distance driver molds at super light weights. Well, this is true, but they should have said, “We just whip the stuff up, put it in a blender, and hope for the best!” Since, as I’ve been told, this is basically all they do. Now that I’ve got some good old “Innova-bashing” in, I can get on with the review! I picked up the Wraith Blizzard, at 146 grams. There were almost all the weights available, from below 130 grams, up to 156 grams. The disc I finally chose just gave me the best feeling in terms of craftsmanship. These discs are anything but consistent in terms of looks or build. I’m not saying they’re crappy at all, I’m just saying that two discs, of the same weight, in “Champion Blizzard,” are often COMPLETELY different. Most have big domes, and they’re all very flexible. However, some of the domes are very bubbly, and some of the rims are very bubbly. I imagine it is quite difficult to be perfectly consistent when you’re essentially infusing your plastic with a type of “froth.” I chose a disc with a medium amount of dome bubbles, at a higher weight, but not the full 150 grams. Are they legit? Yes. They do fly further than you’re used to, with less power. Is this a passing phase? No way. This is definitely a game changer. But there are some players that won’t find a need for them, and there are plenty of courses that don’t merit carrying a max distance disc. First off, I don’t believe that flick-style drivers (or side arm) will really take to them as much. The weight of a disc in that style of delivery is important for the torque of the wrist and arm, and if you went to a light weight, you’d have to change your delivery (in my opinion). Also, what good is topping out at 350 feet instead of 305 feet if you’re playing a technical, tight wooded course with mostly holes in the 290’s? I throw back hand, right handed, and when I want to remain accurate, I can throw my seasoned 171 gram Star Wraith a legitimate 310 feet (landing at 300, sliding 10 feet approximately). As a fourth year player, I’m really dialing down my focus on power and footwork, and focusing on a level throw, with a confident accurate snap. This being said, I love this Blizzard Wraith for wide open distance. I can remain conservative in my delivery, throwing at about 70% of my MAX/GO CRAZY/ALL OUT power- and I see great results. At hole 18 of Cliff Stephens, a 695 foot par 3, I got pretty carried away with my initial drive using the Blizzard Wraith. I went beyond my comfort level of power, and basically released way late- the disc flew towards about one o’clock- it stayed clean of trees or branches, but got way too much air under it. The disc flew anhyzer for about 60% of the flight, but I would NOT say it flew “flippy.” Anyway, the disc got too much height, I lost track of it behind a tree with high branches, and eventually found it about 370 feet from the teepad. Am I exaggerating the distance? No. How do I know? Because my next shot was also thrown with the Blizzard Wraith. I reeled myself in, and threw the disc exactly as if I was throwing a 240 foot approach with a Leopard. Level release, smooth footwork, and confident snap. This sucker barely hinted at an “S” curve, stayed straight almost all the way to the pin, and then as it got close to the green, it faded pretty hard- like a Wraith. I then sunk a putt from about 25 feet, which was at least 10 feet past the pin-high height. Essentially this meant I threw two shots for a total of about 705 feet, one of which was WAY right, probably making total distance more like 740 feet. This is anything but typical for my game. The previous round I played at Cliff Stephens had me throwing a Lat 64 River straight as an arrow about 310 feet towards the pin, followed by a Banshee drive about 330 feet. I then jump putted and missed a 50 footer. The big questions, for which I unfortunately have no answer, are how does it handle the extreme wind? And how is the durability? I imagine it will be durable in terms of hunks, scuffs, and scratches, but the air bubbles makes the disc way more flexible. It probably won’t hold up very well if you crush it into a bag (shape-wise), or leave it in a super hot car- this stuff is gummy at room temperature. And the wind question is just something you’ll have to experiment with. Obviously, the Boss version will be better suited for any wind- but I would believe if thrown correctly, it should perform decent. If you throw a spike hyzer with the wind pushing straight at the bottom of the exposed flight plate- it doesn’t really matter what weight, you’re going to see your disc go far in the wrong direction. So there we have it. I recommend trying one out- whichever your favorite mold is- out of the four available, give it a shot. If you hate it, don’t worry, there will be someone who wants it- either for their bag, or to try- because eventually we all want to see what all this fuss is about! 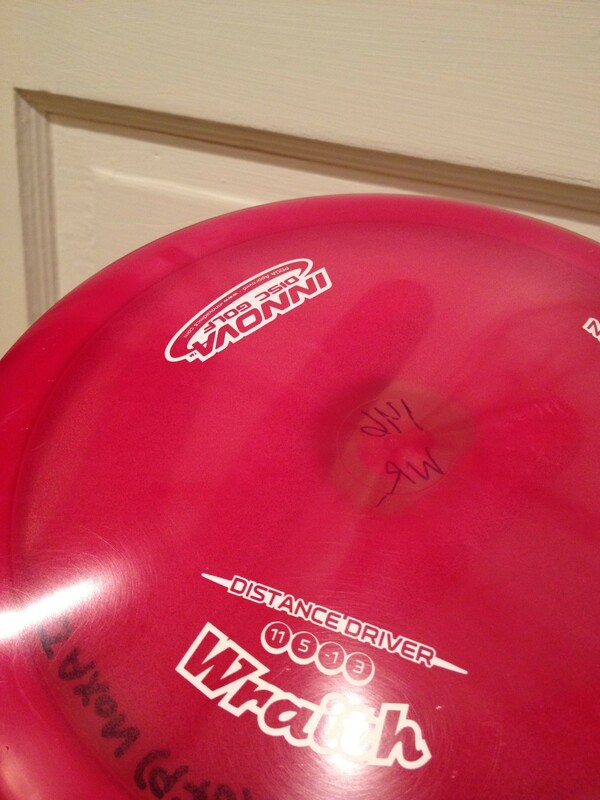 This entry was posted in Equipment and Gear and tagged blizzard, champion, disc, golf, innova, review, wraith. Bookmark the permalink.